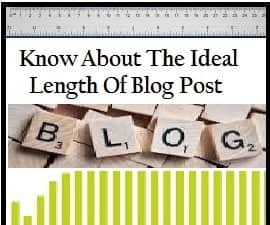 This is the good question for a blogger to know about the ideal and actual length of blow post. You can not analyze online content. The main point is that the blog is your personal platform to express your views ideas there. It can not be possible that you will use those matter in your post that is actually not happened. So, many bloggers extended the length of blog content to get the rank in Google Search Engine. They try to expand the content in the 1000 word minimum, but they serve the sentence only for the long length of the blog post. You write the online content for your reader, not for Google search engine. Your reader visit on site to find the solution from your content. He has limited and precious time which they spend on your blog. A very long content raise irritation. Next time they will visit other sites for the solution. You lose your reader. Your blog post should be based on content fact. Every sentence should be knowledge-based. The quality of ideal online blog content is important instead of the length of the blog post. Your content language should be simple and ethically right. Google search engine gives the importance to that content which is providing the solution incomplete way. A pointwise description is the sole of the blog post. Search engine ranks the content on the basis of quality, description, analysis and ethically right. The precise and valuable content always appreciated by the reader. So, many bloggers write the content in 500 to 600 words, extend to 1000 word maximum. But the traffic on his site increased day by day. Did you visit on the blog of Amit Agarwal, the blog content length is maximum 600 words but the blog is very reliable and visitors faith on this. The blog name is Labnol.org. To increase the traffic on the post is depend on the visitor's satisfaction. A solution provider blog always adds the new reader. Another point you take care to publish the ideal online blog post frequently as well as serve new and valuable content among the readers. This will reflect the positive sign of the blog. The reader will frequently search for your blog to read the new content. 8 best way to retain your valuable reader with some tips. D) Reduce page loading time, Maximum time should be less than 3 seconds. The best judgment point for you that to analysis the maximum time spends by the reader on your blog and what is the length of the blog. You will get some decent data. So, many other things you can adapt to confirm the revisit of the reader on your site. These are some tips, which you can adapt to increase and retain your reader in an ideal and ethical online short article. Share this post with your colleague, if like it or drop your message below given box.